Polyunsaturated fatty acids (PUFA) are nutritionally essential since they cannot be synthesized de novo from two-carbon fragments. As a result of their unsaturated double bonds, PUFA are susceptible to chemical reactions with reactive oxygen and nitrogen species (ROS and RNS, respectively). PUFA incorporated into phospholipids and present in biological membranes not only influence membrane fluidity, curvature, and the properties of membrane microdomains, but increase also the risk for chain reactions of lipid peroxidation leading to membrane destabilization and cellular dysfunction. Vitamin E, the main lipid-soluble antioxidant, stabilizes membranes by itself and protects PUFA by scavenging lipid peroxyl radicals. Thus, vitamin E and PUFA form an interdependent chemical pair in which vitamin E protects PUFA, whereas excess PUFA “consume” vitamin E, a high PUFA/vitamin E ratio being generally assumed as disadvantageous. In cells, both PUFA and vitamin E have their own redox-independent regulatory functions, mostly after being metabolized to active lipid mediators able to bind to specific enzymes and receptors involved in modulating specific signal transduction and gene expression pathways. Thus, the efficiency of uptake, transport, and metabolism of vitamin E and PUFA, their interaction, and their consequent relative levels in cells and tissues are important determinants for both physiological and pathophysiological cellular functions and therefore influence the risk for a number of diseases. Azzi A. Many tocopherols, one vitamin E. Mol Aspects Med. 2017; https://doi.org/10.1016/j.mam.2017.06.004. Jiang Q. 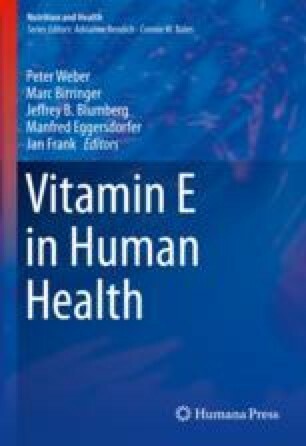 Natural forms of vitamin E: metabolism, antioxidant and anti-inflammatory activities and the role in disease prevention and therapy. Free Radic Biol Med doi: S0891-5849(14)00152-X [pii]. 2014; https://doi.org/10.1016/j.freeradbiomed.2014.03.035. Zingg JM, Azzi A, Meydani M. Alpha-tocopheryl phosphate induces VEGF expression via CD36/PI3Kgamma in THP-1 monocytes. J Cell Biochem. 2017; https://doi.org/10.1002/jcb.25871. Borel P, Desmarchelier C. Genetic variations involved in vitamin E status. Int J Mol Sci. 2016;17 https://doi.org/10.3390/ijms17122094. Goncalves A, Roi S, Nowicki M, Niot I, Reboul E. Cluster-determinant 36 impacts on vitamin E postprandial response. Mol Nutr Food Res. 2014; https://doi.org/10.1002/mnfr.201400339. Libinaki R, Gavin PD. Changes in bioavailability of Omega-3 (DHA) through alpha-tocopheryl phosphate mixture (TPM) after oral administration in rats. Nutrients. 2017;9 https://doi.org/10.3390/nu9091042. Choi J, Leonard SW, Kasper K, McDougall M, Stevens JF, Tanguay RL, Traber MG. Novel function of vitamin E in regulation of zebrafish (Danio rerio) brain lysophospholipids discovered using lipidomics. J Lipid Res. 2015; https://doi.org/10.1194/jlr.M058941. Chiang N, Serhan CN. Structural elucidation and physiologic functions of specialized pro-resolving mediators and their receptors. Mol Aspects Med. 2017; https://doi.org/10.1016/j.mam.2017.03.005. Kono N, Ohto U, Hiramatsu T, Urabe M, Uchida Y, Satow Y, Arai H. Impaired alpha-TTP-PIPs interaction underlies familial vitamin E deficiency. Science. 2013.; doi: science.1233508 [pii] https://doi.org/10.1126/science.1233508. Gong B, Shen W, Xiao W, Meng Y, Meng A, Jia S. The Sec14-like phosphatidylinositol transfer proteins Sec14l3/SEC14L2 act as GTPase proteins to mediate Wnt/Ca2+ signaling. ELife. 2017;6 https://doi.org/10.7554/eLife.26362. Korosec T, Tomazin U, Horvat S, Keber R, Salobir J. The diverse effects of alpha- and gamma-tocopherol on chicken liver transcriptome. Poult Sci. 2016:pew296. https://doi.org/10.3382/ps/pew296.